Lisa Schroeder, Author: ALA Recap - better late than never! I know. ALA was a long time ago. By now, in a world where everything is posted on-line as it happens, if you wait a week to post about it, most people have forgotten about it. But I did this crazy thing after ALA. I took a vacation! A real, honest-to-goodness vacation. I did have my computer, but blogging during vacation time did not seem right. 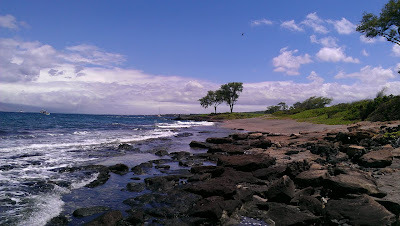 After all, when you are in Maui, you should be on beaches like this, not on the computer! place to ourselves. It was awesome! Sunday morning, I was up bright and early to get ready for the YALSA coffee klatch. I love this event! Every four minutes, authors go to a different table and talk with a different group of librarians. It's like speed-dating, but with librarians. Cool, right? I did it for the first time at ALA in 2009, in Chicago. I loved hanging out in the green room before hand, where all the authors gathered. 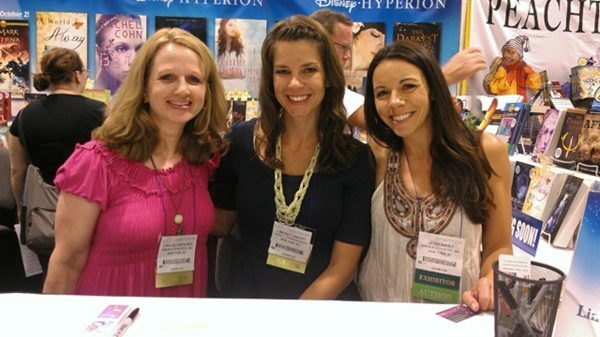 I got to meet Sarah Dessen and E. Lockhart that year. And Richard Peck! The green room is a fun place to be, trust me! I was very disappointed I didn't get to do the green room this year. See, I didn't get to do it because I was late. I was late because I got lost. It sort of traumatized me, honestly. I found myself in a not-so-nice part of Anaheim, because I'd gone in the wrong direction, and when I went into a convenience store and called for a cab, I was told it'd be a 30 minute wait. Knowing that probably meant it'd actually be an hour wait, there was no way I could go that route. There was nothing else to do but hoof it back the way I'd come and then on to the hotel from there. Hoof it I did. I ran through the streets of Anaheim. Literally. In tears, and in my pink dress. And flip flops I'd put on at the last second, thank goodness, stuffing my wedges in my bag to put on when I arrived. I wouldn't have been able to run if I'd worn my wedges. My prayers were answered when I came upon one of the ALA shuttles running around town. I got on and the driver took us to the convention center. Though the event wasn't at the convention center, but he was so nice and let me off so I could directly get on the bus taking people to the Hyatt. There were only 8-12 librarians on that shuttle, but they were ALL going to the coffee klatch, like me, and they were ALL late, like me! They were the nicest librarians EVER and told me it would be fine. And it was. I got there at 9:10, just as the authors were walking in to be seated. I don't know why I'm blogging about this, I told everyone I saw about my traumatic morning, and I'm sure I will not forget it as long as I live. Okay, on to much more important things than my terrible sense of direction! 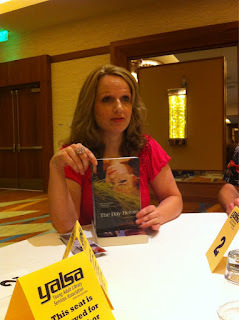 Angela Frederick, a librarian from Nashville, TN, snapped this picture of me when I was at her table and shared it on twitter. I happened to notice a couple of Morris award stickers on badges and couldn't help but mention my friend, L.K. Madigan, who won the Morris award a couple of years ago. Turns out Angela was on that particular committee, and got to spend some time with Lisa. So, for a minute, we talked about sweet Lisa. That was just one table of many - the 50 minutes went by in a blink of an eye! I'm so happy to not be lost anymore. After the coffee klatch, I met up with the fabulous Jessi Kirby, whose YA novels I LOVE, like whoa! And now I can say I love Jessi as much as her books - so sweet! We walked the exhibit hall for a bit until my dear friend Lindsey Leavitt, arrived. Here we are at Lindsey's signing later that day, at the Disney booth (Lindsey was signing her third PRINCESS FOR HIRE book, A FAREWELL TO CHARMS, which I just finished reading. SO GOOD!). Does it get more fabulous than this? I think not. 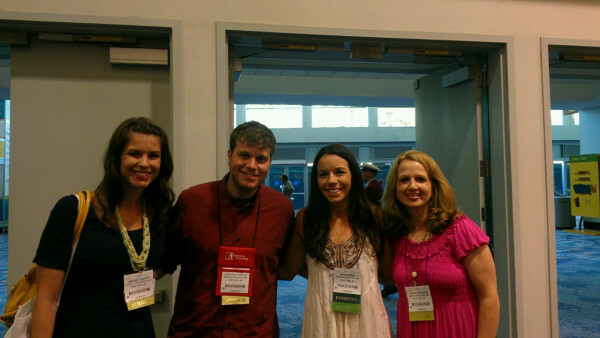 Yes, here we are with the Printz award winner, Corey Whaley, who wrote the amazing WHEN THINGS COME BACK. Fortunately we didn't get stuck in those doors when they all slammed shut because of a fire alarm. It was like a scene out of a horror movie, I'm telling you. Amazing someone didn't get hurt. I was sad I didn't get to hear Corey's Printz speech, which was Monday night, but I believe it will be on-line at some point. He was excited about his speech, not nervous at all. I want to be Corey when I grow up. I signed books at the S&S booth and people waited in line and bought books in order to get an ARC of my upcoming YA novel, FALLING FOR YOU. THANK YOU to everyone who came to see me!! 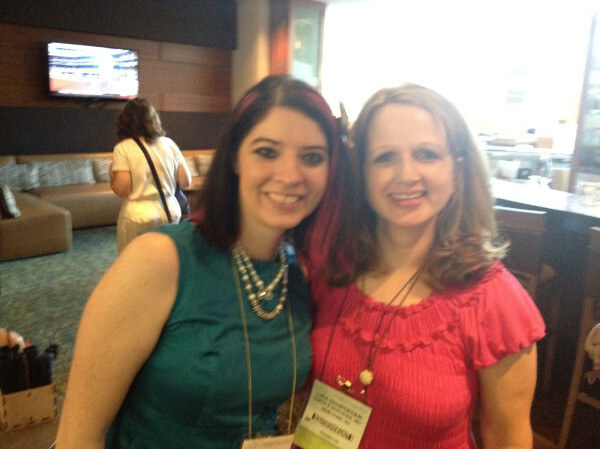 Here is a picture of me and Lena (her blog is here) - a sweet blogger from Texas who said she'd waited 3 years to meet me. Yay, we met! And she's awesome. Wow, Lena, I seem to be squeezing your arm extremely hard. Hope I didn't leave bruises! I was just so happy to see you! 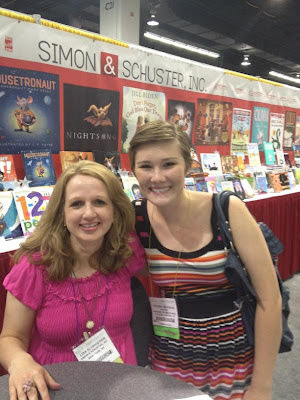 And next is a picture of me and Kelsey (her blog is here), another awesome YA blogger! There were many others, but these were the pictures I saw on twitter, and I know Kelsey and Lena well enough to ask if I could borrow their pictures for my post. 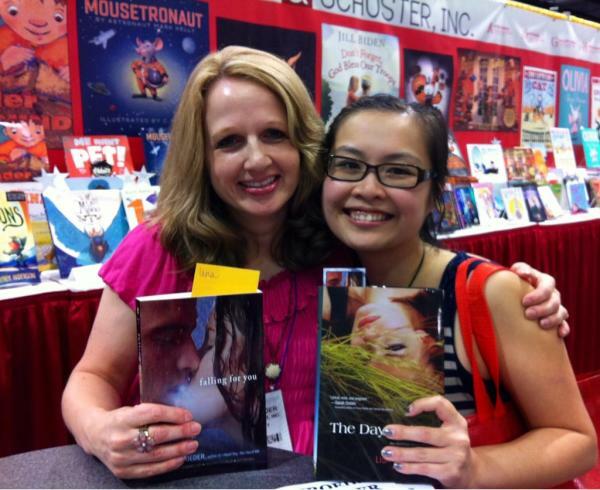 I'm so appreciative of everyone who came by to buy books, get ARCs and say hi. Again, thank you!!!!! She loves cupcakes like me. We look like cupcake lovers, don't we? I ran into MG authors Sheela Chari and Mike Jung at one point, but alas, I have no pictures of them. I had met Mike before, and I'm super excited about his upcoming MG novel, GEEKS, GIRLS AND SECRET IDENTITIES. It was great to meet Sheela after all these years! VANISHED is the name of her wonderful MG mystery. Later that day, I met up with a bunch of people for cocktails and got to chat with one of my favorite librarians, Sara Bean Thompson (her blog is here). 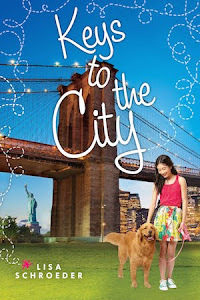 After that, I had dinner with the always sweet and awesome Shannon Messenger, whose books KEEPER OF THE LOST CITIES (MG) and LET THE SKY FALL (YA) are not out yet but are already creating LOTS of buzz. Pretty sure it won't be long and I will have to make an appointment with Shannon's publicist in order to spend time with her. I predict big things for her. Big. Things! Neither of us took a picture, dang it. I'm pretty sure it was because I was starving after running a marathon earlier that morning trying to get to the coffee klatch I was late for. I only picked up a few ARCs, but I got the one I wanted the most. I teared up as I held it in my hands. 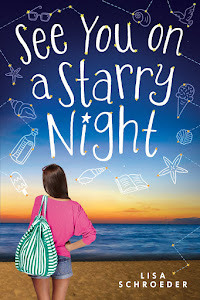 Yes, this is the book by Bridget Zinn, a Portland YA-writer friend who lost her battle with cancer last year. I can't wait to read it. I'll just end this post by saying - thank you YA librarians, for all you do! I'm honored to have spent a day at your conference and to have met so many of you!! Ha! You are far too sweet (and give me far more credit than I deserve). But I know--I can't believe we both forgot to take pictures. Good thing we'll be seeing each other in Texas in Oct. <3! Oh no! Getting lost does NOT sound fun! But the rest sounds like a blast! I SO wish I could have went, I'm dying for an ARC of FALLING FOR YOU and I know how hard it is to get ARC's of your books. Oh well, I will read it when I read it. 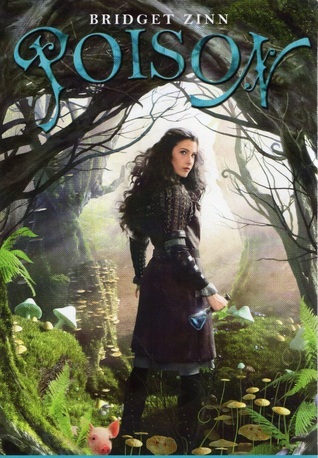 And Poison, yes- DYING to read that one!